Rescuers work on a search operation at an apartment building that collapsed after a strong earthquake in Hualien County, eastern Taiwan, Feb. 7, 2018. 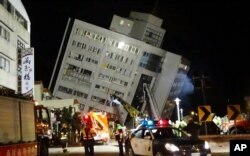 A magnitude 6.4 earthquake struck late Tuesday night caused several buildings to cave in and tilt dangerously. Most survivors of Tuesday night’s strong earthquake in Taiwan escaped because they were on high floors that did not collapse, allowing rescue workers to find them. As of Friday morning, 830 people had left the four collapsed or damaged buildings in the Pacific coast city of Hualien. Many broke windows or climbed out via balconies to escape the two worst-hit buildings, a 10-story hotel and a 12-story commercial-residential complex. Firefighters waited below with ladders. The quake killed 10 people, including hotel guests and workers who were on lower levels of the buildings when the quake struck at 11:50 p.m. Taiwan’s Central Weather Bureau recorded the quake as a magnitude 6 at its epicenter off the coast, and in Hualien it was felt with an intensity of 7, enough to cause widespread damage. “A sound, it made a sound like a tract of wooden floor boards were ripping apart, for one minute,” said Chang Te-chuan, 77, who escaped the commercial-residential complex’s fourth floor. The building was sliding downward at a steep angle, pushing two lower floors into the ground. But with the fourth floor suddenly near the street outside as the whole building tilted, Chang grabbed a flashlight and was able with a firefighter’s help to get out through a window. He and about 100 others spent the next day at an elementary school converted to an emergency shelter. Rescuers carry a victim recovered from a collapsed building following a strong earthquake in Hualien County, eastern Taiwan, Feb. 8, 2018. A magnitude 6.4 earthquake struck late Tuesday night caused several buildings to cave in and tilt dangerously. Within the first 18 hours, the 1,644 firefighting personnel and 1,147 army troops had accounted for 68 people including everyone in the third through 12th floors of Chang’s building, Hualien County Fire Department spokesman Chu Che-ming said. Seven people were found dead on the two lower floors. The first and second floors of the building had sunk into the soft ground. Rescue workers said the walls on those floors had been destroyed, leaving just cramped passages between the remaining beams. As of Thursday evening, rescue workers were still searching for a mainland Chinese family of five, a Canadian couple and a Filipino worker, all believed trapped in the Yun Mei Tsui Ti Building’s second-story guesthouse. Rescuers are seen entering a building that collapsed onto its side from an early morning 6.4 magnitude earthquake in Hualien County, eastern Taiwan, Wednesday, Feb. 7 2018. Rescue workers are searching for any survivors trapped inside the building. 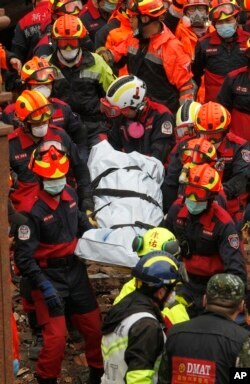 Firefighters had saved 98 people from the Marshall Hotel, a central Hualien landmark that partly collapsed. One person, a 37-year-old hotel staff person, died there. Work paused twice Wednesday at the commercial-residential complex. First, firefighters called in steel beams to prop up the structure and stop it from tilting further toward the ground. Later they paused to place cement blocks around the beams to keep them in place. Damage was less severe at the two other damaged properties, a hospital and a smaller apartment complex. Sixty-six year old Chen Chien-hsiang was awakened by the quake, describing the sound as like the explosion of an “atomic bomb.” The man, who lived alone among 80 households in the Yun Men Tsui Ti Building, was pushed into a crevice of his slanted room to fumble through furniture to reach a glass door to a rear balcony. The structure’s tilting made it impossible to stand up, while a power outage created total darkness, he said. Elsewhere in Hualien, a tourism and fishing town with a population of about 100,000, people spent Tuesday night outdoors or in their cars. They were afraid that the more than 160 aftershocks, some exceeding a magnitude of 5, would cause more damage. Some stayed in one of the city’s three emergency evacuation centers. Local government construction officials plan to investigate why a few buildings were damaged while most construction in Hualien, which is used to earthquakes, withstood the shaking. After a February 2016 earthquake killed 116 people in a toppled apartment complex, investigators discovered liquefied soil and nonstandard construction.